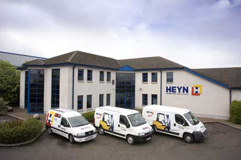 Heyn Handling Solutions, has been providing a range of services to businesses throughout Ireland since 1823. Constantly adapting to meet the changing demands of our customers Heyn has long been recognised as a high quality, professional, and innovative company. Heyn has been structured to maximise opportunities in its chosen markets. Building on its history of service excellence and premium quality products, Heyn offers a unique combination of experience, technical expertise, and professionalism. Our core activities include Engineering services, Fork Truck services, Environmental and Shipping services. Contact any of our team to explore the solutions we can provide.